Q. How do I determine if a motor is suitable for use with a variable frequency drive (VFD)? A. Three major factors should be considered when determining if a motor is compatible with a VFD: the motor winding insulation, motor bearings and pump operating speed range. While all of these annotations are descriptive to a point, none of them have a standard definition across the industry. Generally, these terms describe motors with winding insulation that may be suitable for use on VFDs, but they might also include other features related to operation on VFDs. The manufacturer should be consulted directly for determining the winding insulation of a specific motor. In addition, any motors manufactured prior to the NEMA MG 1 Motors and Generators motor standard should be carefully evaluated prior to the implementation of a VFD. When implementing a VFD, proper care needs to be taken to ensure the motor bearings are protected from common mode voltages (CMVs). VFDs can cause common mode voltages when supplying power to three-phase motors. Common mode voltage is a voltage potential between at least one phase and voltage source ground. CMV can cause a buildup of shaft voltage, which can potentially discharge through the motor bearings and cause serious damage to the bearings/motor. A shaft grounding system can be used in combination with electrically isolating the shaft and motor bearings to prevent these damaging discharges. However, CMVs are not always significant enough for bearing damages, so the degree to which motor bearings need to be protected will vary from system to system. The pump operating speed range needs to be taken into consideration. VFDs vary the speed of the pump to optimize system control, usually by lowering the speed below the baseline frequency. When the motor is operated at lower speeds, the capability of the motor cooling system is reduced because the motor cooling fans produce less airflow. In some cases the motor can be operated above baseline frequency. When a rotodynamic pump is operated at a speed above the baseline speed, the power draw increase is proportional to the cube of speed increase. As a result, define the pump operating speed range to ensure the motor is not overloaded at increased speed and the motor is able to withstand decreased cooling at lower speeds. Q. What is the difference between NPSHa and NPSHr, and why is it important to know these terms? A. Supplying a pump with insufficient net positive suction head available (NPSHa) compared to the NPSH required (NPSHr) will result in cavitation. Cavitation is the formation of vapor bubbles in the pumped liquid, when the pressure of the pumped liquid drops below its vapor pressure, and later the pressure is increased above its vapor pressure, resulting in the rapid collapse of the pockets of vapor. The vapor implosions can cause serious damage to the pumping system, and typically noise and vibrations are noticeable. NPSHa for a system can be calculated as shown in Equation 1. NPSHr is a minimum NPSHa given by the manufacturer that is required for a pump to achieve a specified performance at a specified rate of flow, speed and pumped liquid. One of the most noticeable effects of cavitation is the degradation of the pump performance due to the presence of the pumped liquid’s vapor phase. Migration and coalescence of the vapor bubbles affect the flow within the impeller and cause the head developed by the pump to deteriorate. 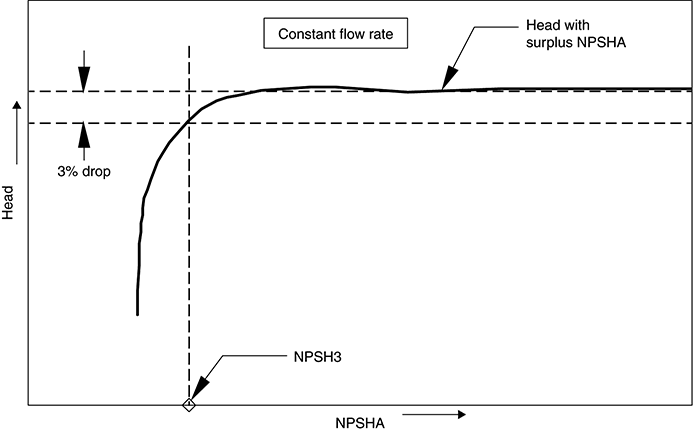 NPSHr curves provided by pump manufacturers may not show sufficient NPSH values to provide zero head loss or eliminate cavitation. The term NPSH3 was developed to better describe the industry standard for NPSHr. By the Hydraulic Institute definition, the required NPSH of a pump is the NPSHa that will cause the total head (first stage head of multistage pumps) to be reduced by 3 percent. The required NPSH qualified by this criterion is NPSH3. 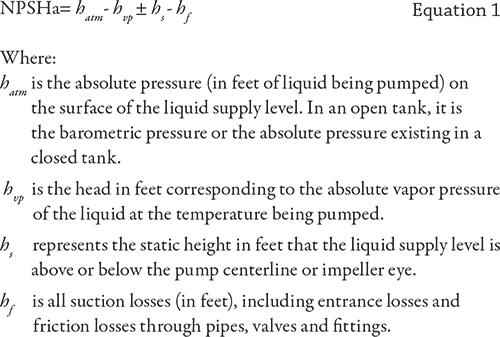 The full published pump head will not, however, be achieved (by definition) when the NPSHa equals the NPSH3 of the pump (see Figure 9.6.1.2c). The value of 3 percent head drop for NPSH3 is based on accepted industry practice for defining a condition of head breakdown due to cavitation. For more information regarding cavitation and NPSH, refer to Module 2 in the Hydraulic Institute’s Pump System Assessment Certificate Program.